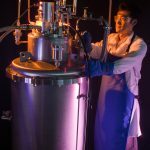 UCF researchers have been conducting solar thermochemical hydrogen production since 2005. Solar-driven thermochemical water splitting cycles (TCWSCs) provide an energy-efficient and environmentally attractive method for generating hydrogen. 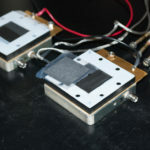 Solar-powered TCWSCs utilize both thermal (i.e. high temperature heat) and light (i.e. quantum energy) components of the solar resource, thereby boosting the overall solar-to-hydrogen energy conversion efficiency compared to those with heat-only input. Hydrogen storage has been one of the biggest challenges for hydrogen fuel cell-powered vehicles. Several major auto manufactures have invested in cryogenic liquid hydrogen storage technologies in which hydrogen is cooled below its boiling temperature of -252.8 °C. 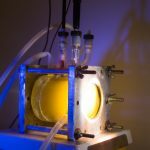 Scientific communities worldwide have been actively searching for materials-based hydrogen storage methods due to potentially higher hydrogen gravimetric and volumetric density, moderate pressure and temperature requirements, controllable hydrogen release, easy storage and transportation, and simplified fueling. A fuel cell converts the chemical energy in hydrogen and oxygen into direct current electrical energy by electrochemical reactions. Fuel cells are devices that convert hydrogen gas directly into low-voltage, direct current electricity. The process is essentially the reverse of the electrolytic method of splitting water into hydrogen and oxygen.